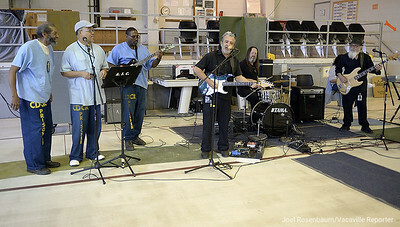 Sacramento Blues musician, Lew Lew Fratis (second from left) and his band mates, Kenny Nichols on drums and Joe Lev on bass are joined by California-State Prison, Solano inmate Rodney Edinbyrd (far left) entertain a group of inmates at the prison Friday during performance of members of the musical development and performance program. 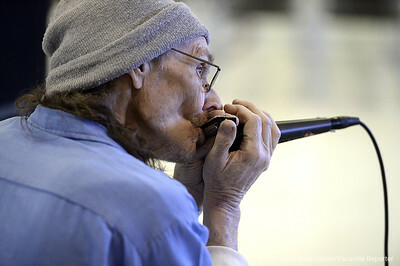 California State Prison, Solano inmate, Jack Loney sings along with the Marvin Gaye song "What's Going On," performed by his fellow inmates and blues artist, Lew Fratis and his band Friday at the prison. 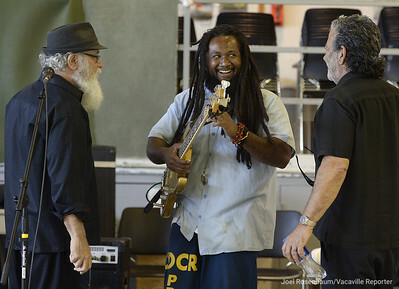 California State Prison, Solano inmate, Charles "Bula" Joseph (middle) laughs as he talks with blues musicians Joe Lev (left) and Lew Fratis after he finished performing with a group of his fellow inmates Friday at the prison. Joseph is a member of Fratis 'musical development and performance program that he has been teaching, Lev is a member of Fratis band from Sacramento. 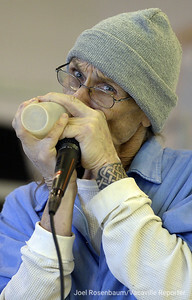 California State Prison, Solano inmate, Michael Woody belts out a blues riff on a harmonica while playing with a group of fellow inmates and Sacramento blues artist, Lew Fratis and his band Friday at the prison. 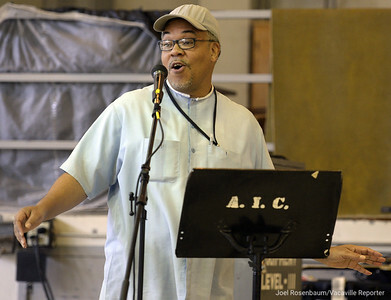 California State Prison, Solano inmate, Roddrick Bazemore performs with a group of fellow inmates and Sacramento blues artist, Lew Fratis and his band Friday at the prison. 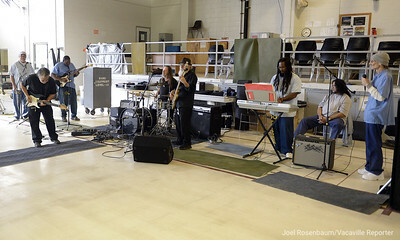 Backed by California State Prison, Solano inmates (from left) Robert Phillips, Roddrick Bazemore and Rodney Edinbyrd, Sacramento musician, Lew Fratis (middle) and his band mates, Kenny Nichols on drums and Joe Lev on base belt out a blues song Friday at the prison. 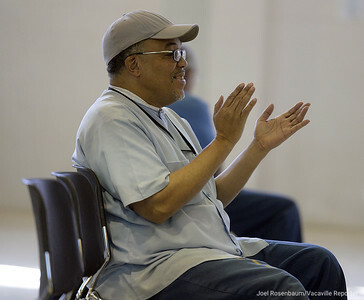 Fratis has been teaching a musical development and performance program for two years and the members gave a performance for fellow inmates and staff. 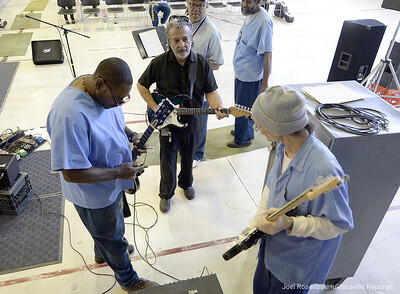 Blues musician Lew Fratis (middle) speaks with California State Prison, Solano inmates, Rodney Edinbyrd (left) and Michael Woody as they tune up their guitars before performing for their felllow inmates Friday at the prison. 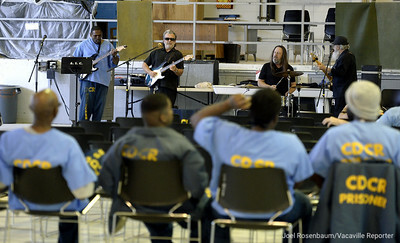 The inmates were members of the musical development and performance program taught by Fratis. California State Prison, Solano inmate,Robert Phillips performs with a group of fellow inmates and Sacramento blues artist, Lew Fratis and his band Friday at the prison. 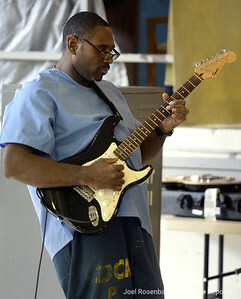 Backed by California State Prison, Solano inmate, Rodney Edinbyrd, Sacramento blues artist, Lew Fratis rips off a guitar solo during a performance by Fratis' band were joined by inmates who are members in a musical development and performance program taught by Fratis. 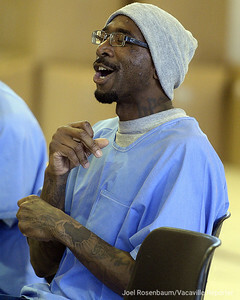 California State Prison, Solano inmate, Roddrick Bazemore applauds the performance by his fellow inmates and Sacramento blues artist, Lew Fratis and his band, Friday at the prison. 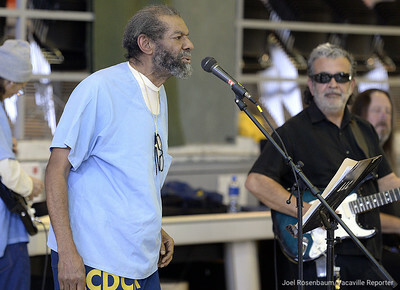 California State Prison, Solano inmates (from left) Charles "Bula" Johnson, Jack Wheeler, Rodney Edinbyrd and Roddrick Bazemore, perform for their fellow inmates Friday at the prison. The group have been part of a musical development and performance program being taught by Sacramento blues artist, Lew Fratis. 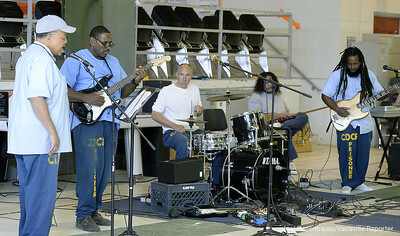 California State Prison, Solano inmates (from left) Roddrick Bazemore, Rodney Edinbyrd, Jack Wheeler and Charles "Bula" Johnson perform for their fellow inmates Friday at the prison. The group have been part of a Musical Development and Performance program being taught by Sacramento blues artist, Lew Fratis. 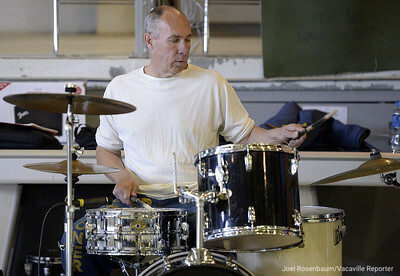 California State Prison, Solano inmate, Jack Wheeler keeps time on the drums while playing with a group of fellow inmates and Sacramento blues artist, Lew Fratis and his band Friday at the prison. 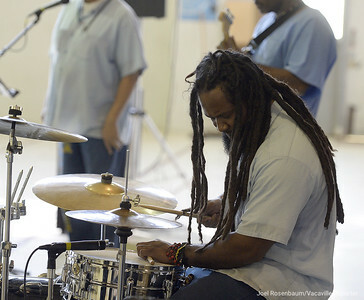 California State Prison, Solano inmate, Charles "Bula" Joseph keeps time on the drums while playing with a group of fellow inmates and Sacramento blues artist, Lew Fratis and his band Friday at the prison. 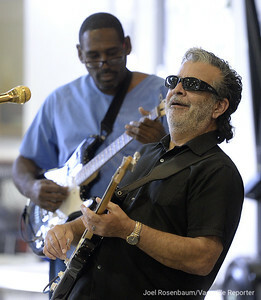 California State Prison, Solano inmate, Rodney Edinbyrd rips off a guitar solo playing with a group of fellow inmates and Sacramento blues artist, Lew Fratis and his band Friday at the prison. 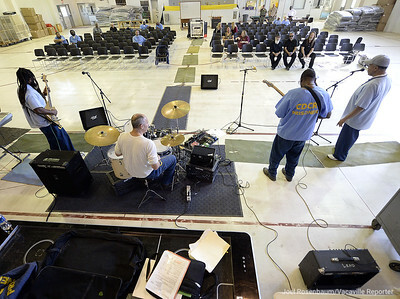 Blues artist, Lew Fratis of Sacramento wraps up his performance with his band and inmates California State Prison, Solano who are members of Fratis' musical development and performance class.